UK studio Rare has always had a habit of being ahead of the curve. The company - founded by Tim and Chris Stamper in the '80s - was one of the first western developers to work on the NES hardware, and in the '90s the firm would pioneer the use of CGI graphics in 2D games with the likes of Donkey Kong Country and Killer Instinct. According to former Rare developer Chris Seavor - the man behind the N64 cult classic Conker's Bad Fur Day and (more recently) one half of Rusty Pup studio Gory Detail - Tim and Chris were also looking into using toys to create interactivity with games way before Skylanders, Disney Infinity and amiibo came along. All of the modern "toys to life" figures are based on Near Field Communication (NFC for short) tech, which is quite a recent innovation and wouldn't have been available to the Stampers back in the N64 era. However, the talented siblings were used to mucking around with tech and it's not beyond the realms of possibility to assume they could have created an alternative system. They reverse-engineered the Famicom in order to learn how to develop for it, and produced the arcade hardware that powered Killer Instinct. They also created a full-colour rival to the Game Boy which was abandoned when the partnership with Nintendo began to blossom. Just imagine having Conker, Banjo, Kazooie and Joanna Dark figures back in the 1990s, each of which could unlock or interact with their respective games. Actually, it's probably for the best that this plan didn't come to pass - Nintendo's amiibo range has drained our bank balance to the extent that we're seriously considering living off cold beans for a month just to afford more. If that kind of plastic temptation had existed in the '90s, certain members of the Nintendo Life team would probably have sold off several vital organs by now. Interesting, although I'm intrigued on the thought of how they would even be able to pull this off if the idea had gone through. Maybe they could have a connection in the pack that fit into the N64 controller memory slot? I remember action figures coming with readable chips back then, especially Star Wars figures around the time of the Star Wars 1-3. This doesn't seem that farfetched. everytime i read a rareware story, i keep thinking of what might've been if nintendo just accepted dinosaur planet as it was. So it wasn't really like an amiibo at all, it was just a figure like those that have been around for decades. It's one thing saying the stampers had the idea for nfc style toys years ago, it's another thing to suggest that was actually one of them. @HyperSonicEXE I remember those Star Wars figures, they were released for Phantom Menace. Sound Tech or something? @Morph Did you read the news story? When was it claimed that the Urchin figure was the NFC model in question? The Urchin toy reminded Seavor about the Stamper's idea. Always helps to read before commenting, I find. "the firm would pioneer the use of CGI graphics in 2D games". Er... think about it. I'd insta-buy a Conker and a Banjo-Kazooie amiibos. Oh, and a Joanna Dark one too. Would be cool. What's Urchin? With amiibo overall. I've totally lost interest in them since the summer. Haven't bought one since (except shovel knight amiibo) then. And I went made and bought them all! Decided to sell on the ones I didn't like or want taking up room and now I have about 12 or so, that just sit there. Anyone else sick of amiibo a year later? @Morph He jokingly says it was an amiibo then in the next tweet admits that it was just a toy - but then says Rare was looking into similar stuff during the N64 era. 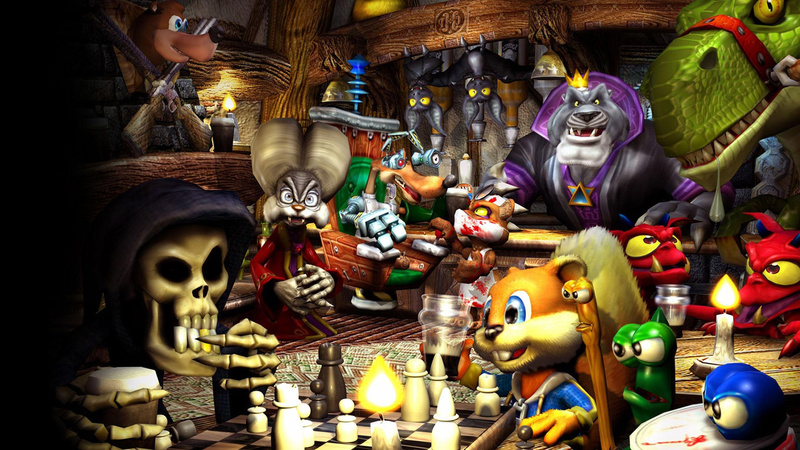 Am I the only one who noticed Conker playing chess with Gregg the Grim Reaper? Man that was a noice shout-out. As for the article itself, though... what can I say? More proof that it was a real shame to lose Rare, although given how I badmouthed amiibos - or rather, amiibo-centric games - in the NST-related article ("Mini Mario & Friends") I have to point out that I'm admiring their foresight on a business standpoint. But hey, just because someone has a great idea, it doesn't mean the people in positions of power and influence, where they realistically might be able to realise said idea, will actually listen and do something about it. And there's a whole lot of people out there with great ideas that will never come to light and no one will ever know about. That's kind of sad. @Morph Wait, why are you freaking out? I read your comments and I can't quite figure out what your problem is. @Jamotello Too late in N64's life to release as Dinosaur Planet unfortunately. I'm a big Star Fox fine and I felt the fitted perfectly into the game - the lead character already looked like Fox McCloud anyways! The Rare design of Fox has always been my favourite ny far as opposed to the CRAP one introduced by Q games in Star Fox DS and sadly used ever since. Ah well. Hey Playtonic, Yooka-Laylee amiibo please! @Morph Sorry, let me rephrase. I read your comments and I can't quite determine what your problem is. What is your problem? I believe so. Amazing how much of this tech we're seeing from the games industry is just recycled or a slightly more advanced version of something prior. That said, the Pokéwalker being the best pedometer is very surprising. Honestly, I have complete faith that 90's Rare would've been able to pull something like this off spectacularly. Kay. What's stopping them now? I'd totally pay for Battletoads, DKC and Snake, Rattle n Roll ones. Who needs nfc? There were a few different options for communication, not the least of which was smart card/smart chips which have been around for years (well before the N64) and used for many applications. I am happy that it didn't happen! I hate Amiibo! !